Dr Dimitris Kardassis obtained his BSc degree from the Department of Biology of the Aristotelian University of Thessaloniki in 1985 and his PhD degree from the Department of Biochemistry of Boston University Medical Center (BUMC) in 1991. He was a post-doctoral fellow in the Section of Molecular Genetics of the Whitaker Cardiovascular Institute of BUMC. In the period 1993-1998 he worked as a Research Associate in the Department of Basic Sciences of the University of Crete Medical School. In 1994, he was awarded an EMBO short term fellowship to work in the laboratory of Dr Miguel Beato in the Institute of Molecular Biology and Tumor Science in Marburg, Germany. 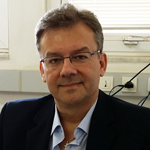 Dr Kardassis was elected Assistant Professor of Biochemistry at the University of Crete Medical School in 1998, Associate Professor in 2004 and Full Professor in 2010. He served as the Chairman of the Department of Basic Sciences of the University of Crete Medical School. Since 1998, Dr Kardassis has been an affiliated member of the Institute of Molecular Biology and Biotechnology of the Foundation for Research and Technology of Hellas in Heraklion. Dr Kardassis is actively involved in Undergraduate and Graduate teaching at the University of Crete Medical School. He was a founding member of the Graduate Program “The Molecular Basis of Human Disease” and is currently the Director of this program. Dr Kardassis has been working in the field of apolipoproteingene regulation and function since 1986. His studies have focused on the characterization of the regulatory elements and factors that control the expression of several apolipoprotein genes including apoB, apoA-I, ApoC-III, apoC-II, apoA-IV, apoA-II, apoE and more recently apoM. He played a major role in the elucidation of the role of hormone nuclear receptors in apolipoprotein gene regulation. He identified and characterized the common enhancer of the apoA-I/apoC-III/apoA-IV gene locus as well as the role of the Hepatic Control Region 1 (HCR-1) in the regulation of the genes of the apoE/apoC-I/apoC-IV/apoC-II gene cluster. More recently, Dr Kardassis is focusing on the mechanisms that control the expression of key genes of High Density Lipoproteins (HDL) metabolism in the liver, epithelial cells and macrophages under basal or inflammatory conditions. He is also interested in understanding how the structure and the functions of HDL are affected by inflammation using animal models of arthritis and IBD, in identifying novel genes of HDL metabolism and novel HDL-based biomarkers and in characterizing natural mutations in the coding regions and the promoters of HDL genes in patients with increased risk for ischemia and myocardial infarction. Dr Kardassis has been the Chairman of COST Action BM0904: “HDL: from biological understanding to clinical exploitation” (2010-2014), a scientific network of top HDL investigators from 15 European countries. He is a member of the Hellenic Society of Lipidology, Atherosclerosis and Vascular Disease, a member of the organizing committee of the European Lipoprotein Club anda fellow of the American Heart Association. In 1999 he received the Young Investigator Award from the European Atherosclerosis Society. He has published more than 80 original and review articles on lipoprotein structure, function and gene regulation.His research is currently funded by the EU fp7 HEALTH program and the Ministries of Education and Development of Hellas (Synergasia, Thalis, Heraklitos, ARISTEIA II). Coronary Heart Disease (CHD) is the leading cause of death in Western societies. Genetic defects in key genes of lipoprotein metabolism which cause dyslipidemia (defined as high levels of LDL and TG and low levels of HDL) contribute to the pathogenesis of atherosclerosis, which is the underlying cause of CHD. Furthermore, pathological conditions such as chronic inflammation, diabetes, obesity and the metabolic syndrome are also associated with lipid and lipoprotein abnormalities but the mechanisms are unknown.Animal models with genetic defects in the pathways of lipoprotein metabolism are extremely useful tools in our efforts to understand the molecular mechanisms behind the association between dyslipidemia and atherosclerosis or other chronic diseases. One example is the mouse model of HDL deficiency due to a genetic defect in the apolipoprotein A-I (apoA-I) gene. Using such models combined with adenovirus-mediate gene transfer we are studying the effects of natural mutations in the human apoA-I or other geneson HDL structure and functions and the predisposition to diet-induced atherosclerosis. We are also applying protocols of antigen-induced arthritis or DSS-induced colitis in micein order to study the role of apoA-I and HDL in the protection from rheumatoid arthritis and inflammatory bowel diseases and to develop novel therapies based on HDL. Finally, in collaboration with European partners we are studying, using systems biology approaches, the molecular mechanisms behind the pathogenesis of the metabolic syndrome which is defined as a cluster of interrelated common clinical disorders, includingabdominal obesity, elevated blood pressure, loss of glycemic control, high triglycerides (TG), and low HDL-C.